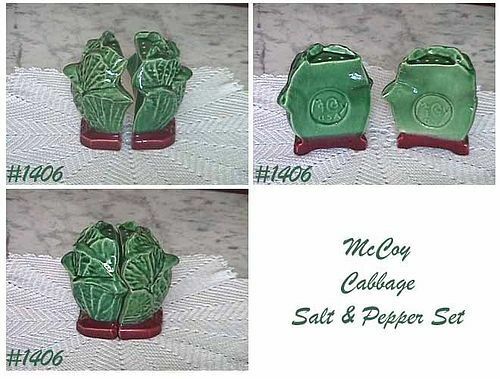 This listing has the difficult to find McCoy cabbage salt and pepper shaker set! Made in 1954, these shakers measure 4 1/2" tall (at tallest). Each shaker is 1/2 of the cabbage and each is on a red base -- base has "salt" on one, "pepper" on the other. Both shakers are marked McCoy, USA. They have no cracks, no chips, only light crazing. One leaf tip on pepper has a production non-glaze, production non-glaze also on corresponding spot on salt shaker -- this is not damage, it is simply a production McFlaw. This set has obviously been much pampered. Shakers do not have stoppers -- original stoppers were cork and could easily be replaced. However, prior to your purchase, I will check to see if I have replacement food grade rubber stoppers -- if so, I will include at no cost. This is an exceptional set and would be a wonderful addition to any McCoy collection.